Honouring two decades of service to the Midland Lions Club, founding member and treasurer for eight years, Lion Gilmour Nesbitt (Nebbie) is presented with a rocking chair and a new TV to go with it. 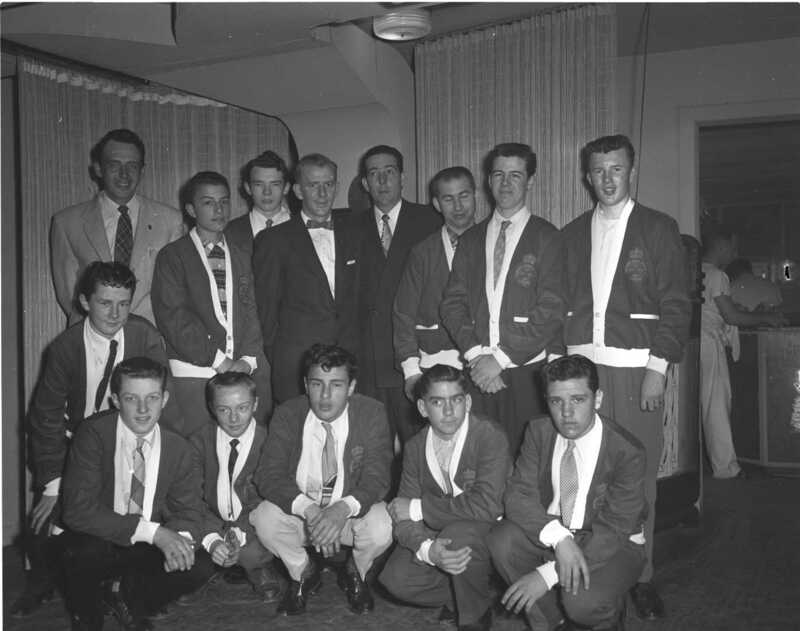 The presentation was made at the annual dinner of the club held at the Delawana Inn in Honey Harbour. 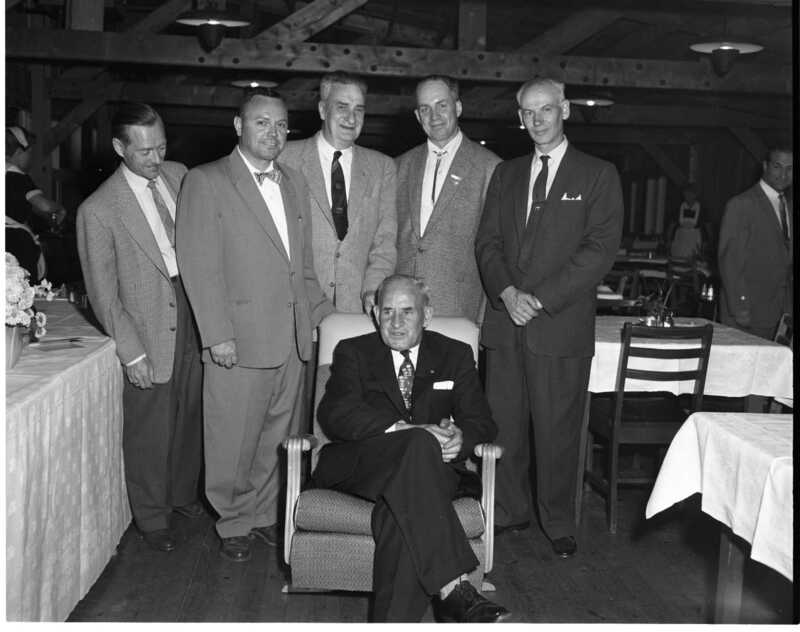 Gilmour is surrounded by past presidents; Webb Struthers, Bill Jeffery, Alex McIntosh, Ed Walker and Gord Boyd. 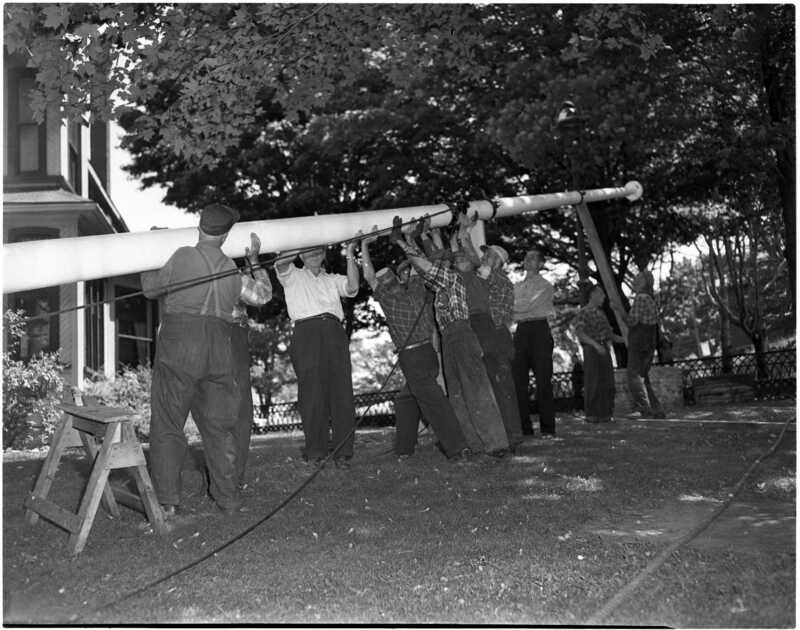 Town employees raise the newly re-painted flagpole at Midland’s Huronia House Museum in preparation for a new season. Just about the happiest bunch of fellows in Ontario at the moment are the members of Port McNicoll’s volunteer fire brigade. Some of them, with Chief Lloyd Cameron in front, are seen grouped around their brand new fire truck, which arrived Saturday. 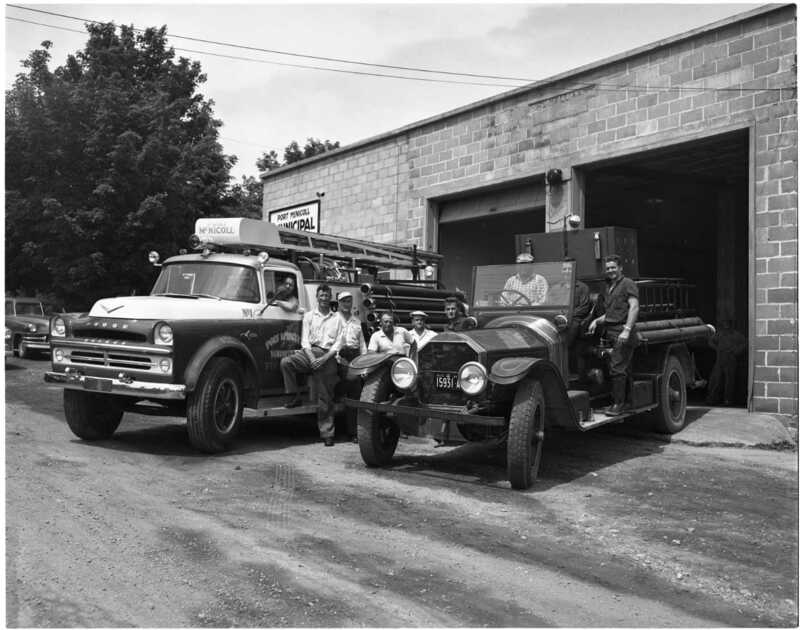 Still, others are seen on the old 1919-model engine purchased from Toronto Fire Department in 1950. 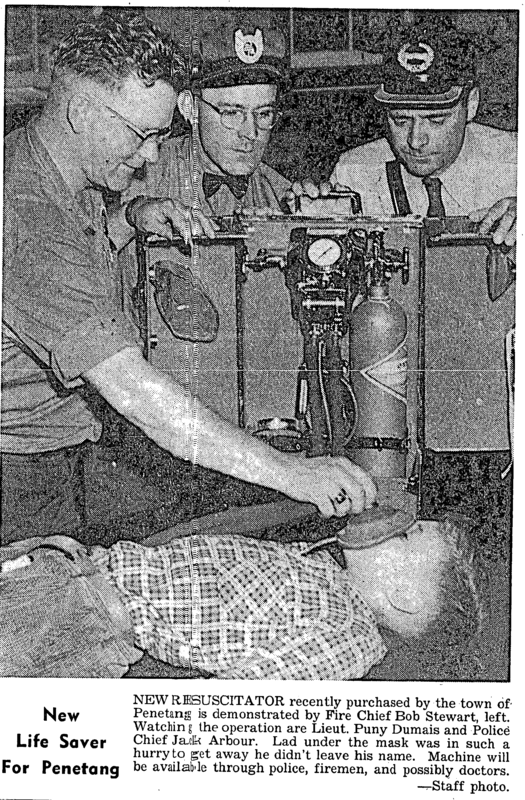 Along with the new $17,500.00 truck, the brigade also has the latest type resuscitator. Nearly ninety golfers from several Simcoe County clubs turned out for the open invitation match held at the Midland Golf & Country Club June 12th. The eventual winner was Walter “Windy” Varty from Orillia with a gross of 76. Pictured are A. I. 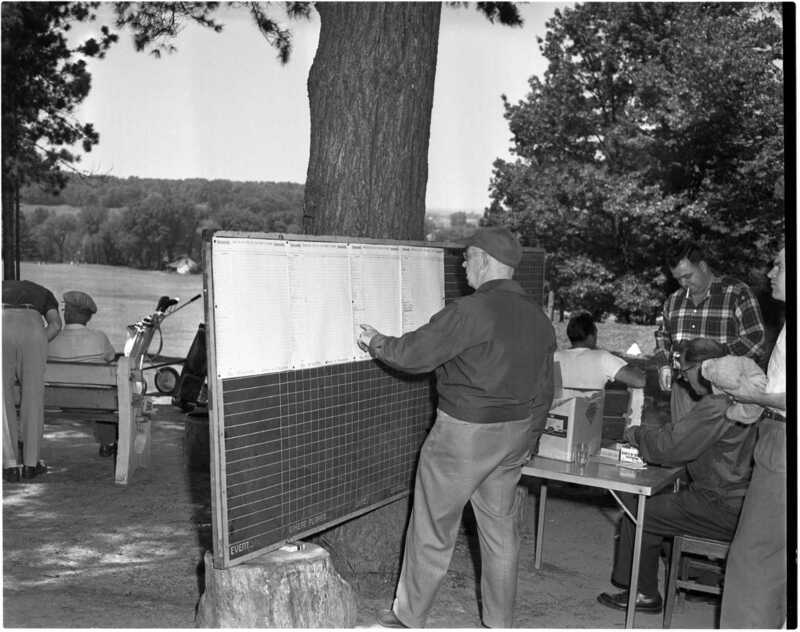 “Doc” Merchant checking the scoreboard while club captain Norm Greene takes Clive Parks entry fee. One of the highlights of the annual year-end dinner held by the Midland Lion’s Club at the Delawana Inn is the installation of new officers. Pictured is the new president Cecil English and his wife Maddy and the outgoing president Bill Jeffery and his wife Judy. 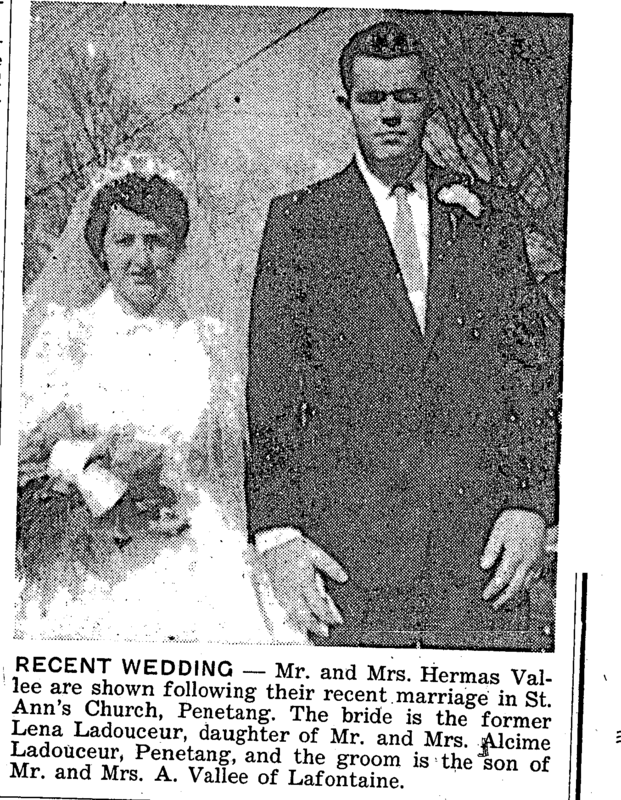 Back in 1909 two brothers from Vasey married two sisters from Omemee. 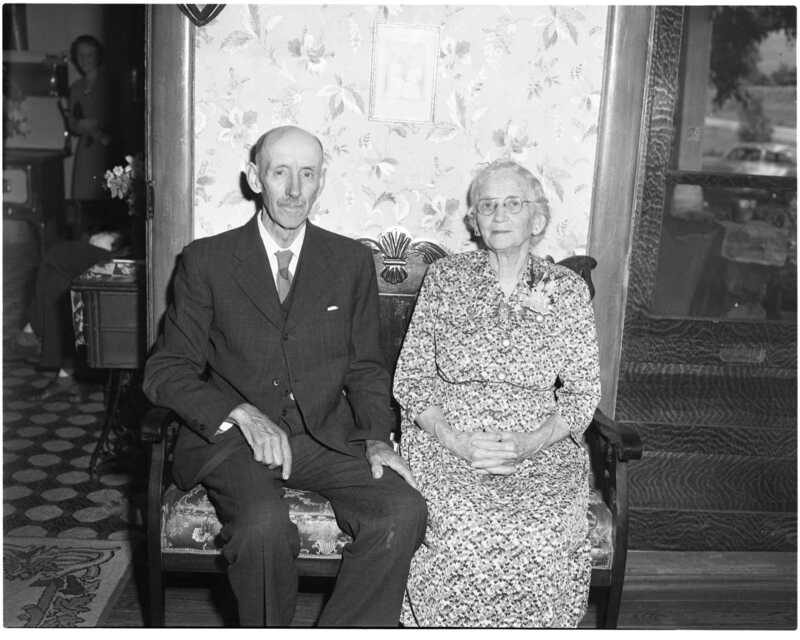 One-half of that combination is pictured, Mr. & Mrs. Louis Jones farmed just west of Port McNicoll on Highway 12 and still live there. Mrs. Jones’ sister Minnie died a few years ago and her husband James Jones lives with his daughter Mrs. Delbert Reynolds at Wyevale. 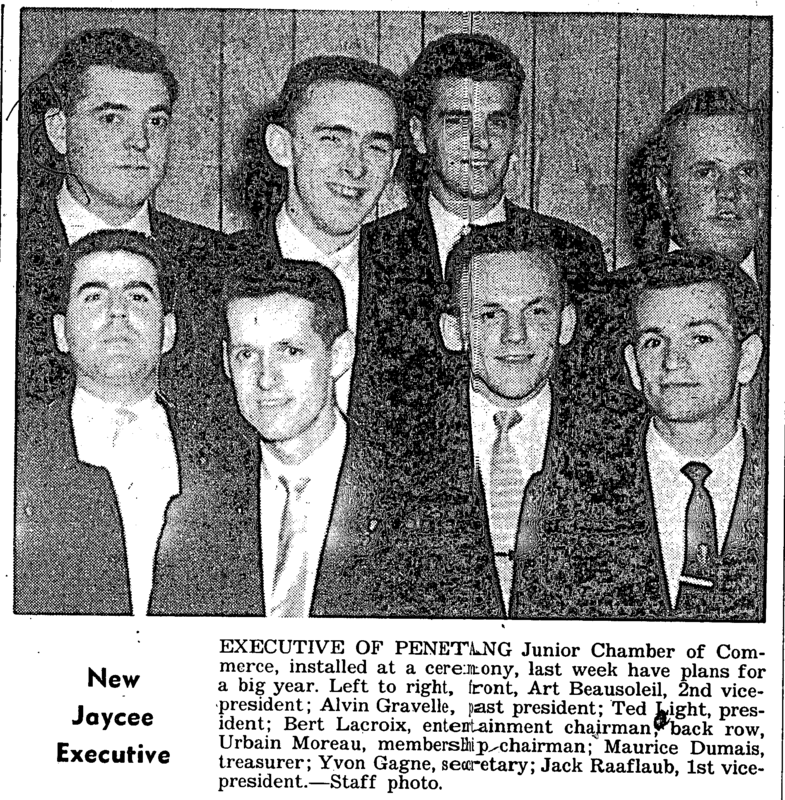 The headline, County Herald, Friday, June 19th, 1957. Severe Electrical Storm Causes Extensive Damage in North Simcoe. Following on the heels of a three-day heat wave, a severe electrical storm caused extensive damage to district telephone and power lines, damaged numerous household appliances, radios and TV sets and struck one summer home in Tiny Township Tuesday morning. Although it brought cooler weather in its wake, the storm left a trail of toppled trees, leaning telephone poles on some rural lines, and scattered tree branches. Paving operations on County Road 6 from one mile north of Elmvale to Wyevale got under way last. week. 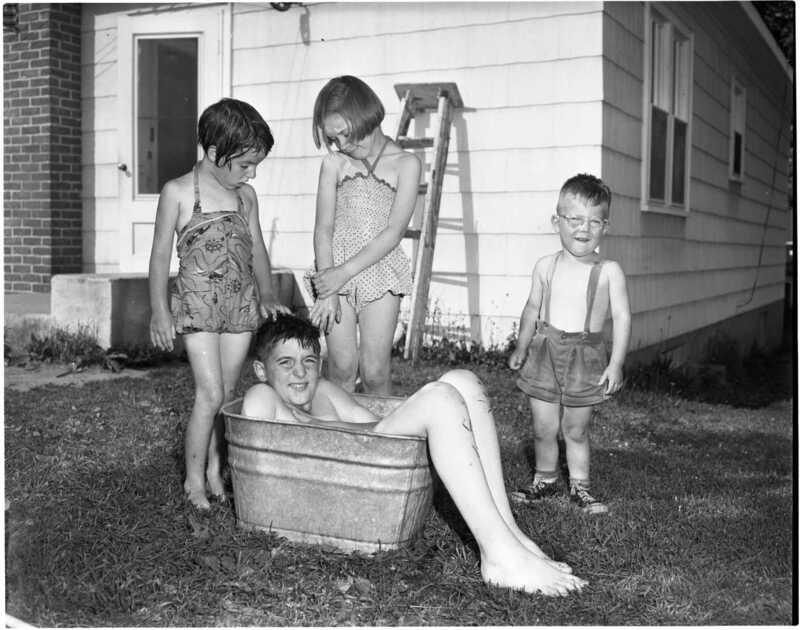 The four and one-half mile stretch of work is being done by Brennan Paving Co.
No lawn or garden sprinkling will be permitted until further notice. Midland Public Utilities Commission. 25 YEARS AGO THIS WEEK – Public Utilities Commission representatives from Georgian Bay district municipalities held a special meeting in Collingwood. The main item under fire was a practice of the Ontario Hydro of demanding large sums from municipalities two years after all accounts have been paid. The 43 delegates present decided to hold an organizational meeting in Midland in September and to elect officers who would lodge a determined protest against the practice. * * * A Toronto construction firm had been awarded the contract for constructing the extension to Midland dock. It was the lowest of ten who bid for the work. * * * Thiffault opened a new bakery at Waubaushene. More than 600 district citizens attended the official opening which featured dancing and refreshments. * * * A Romanian girl parachutist, Samaranda Braescue had established a new world record jump, Miss Braescue and pilot Harry Dosshardt climbed to 24,000 feet over Sacramento, Cal., in a light bi-plane. Miss Braescue bailed out and landed safely at Marysville, near Sacramento. * * * Millions of feet of lumber were destroyed in a fire which swept through the lumber yards at the Letherby-Nicholson plant in Midland. The blaze, of undetermined origin, broke out about 8 p.m. on a Wednesday night. Penetang brigade was called to assist the Midland firemen. * * * Provincial police officers arrested two men and a boy in connection with a series of cottage break-ins in the Go-Home-Bay area. One of the two men was later given two years in Kingston Penitentiary, the other received from one to two years in Burwash and the boy received a 30-day jail term. When the old community center in Little Lake Park was cut into three sections for transportation to its new site on ski club property, it was discovered that the flooring was three inch by one inch Douglas fir—LAID ON EDGE! OBITUARY: Funeral service for Mrs. J. Cena Brunelle, Penetang, was held in St. Ann’s Church, Penetang, Monday, June 3, with Rev. L. McGough officiating. Interment was in St. Croix Cemetery, Lafontaine. Pallbearers were Roger and Martial Brunelle, Roland, Celestin, Gabriel and Urbain Maurice. The former Lena Payette, Mrs. Brunelle died in Penetang General Hospital Friday, May 31, following a short illness. 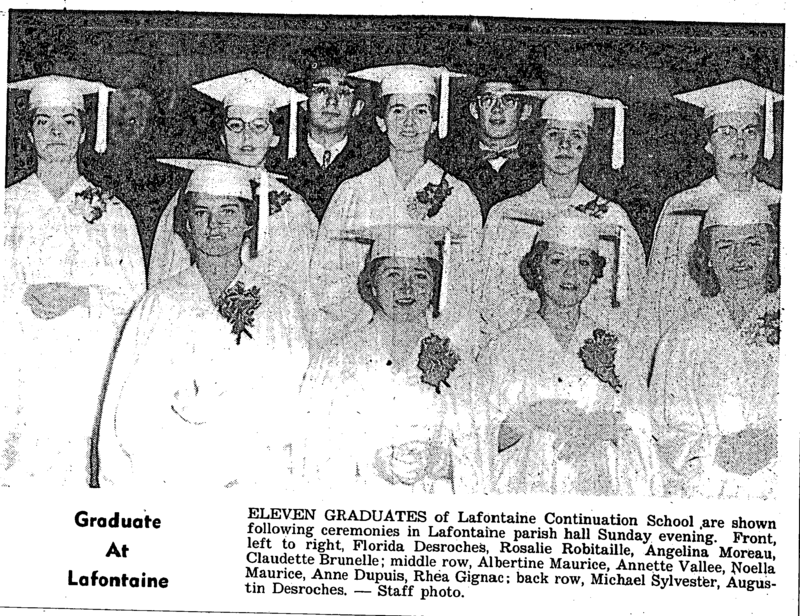 Born in Lafontaine. June 13, 1892, she spent her early life and married J. Cena Brunelle there in 1910. The couple moved to Penetang 30 years ago. She was an ardent gardener, and particularly interested in horticulture. Many people in Penetang admired her flower gardens which were one of the town’s show places each year. She was a Roman Catholic. Surviving, besides her husband, are six sons. 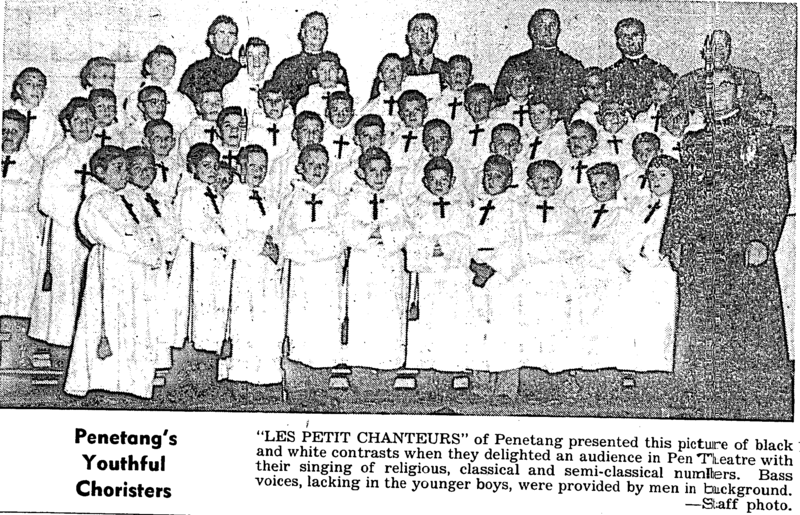 Maurice, Eugene, Marc and Joseph of Penetang, Cleo, Montreal, and Jacques, White River; and five daughters. 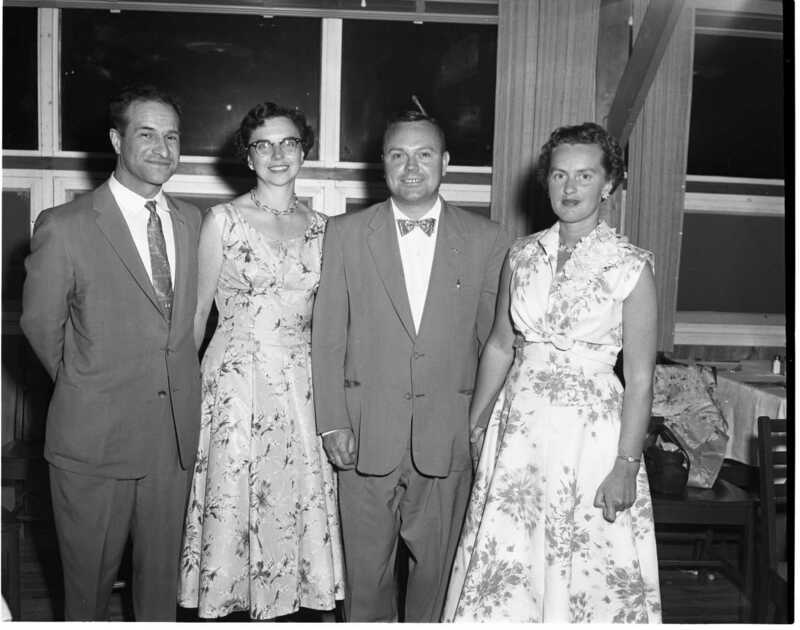 Mrs. J. Crawford and Mrs. Art Roy, Sudbury: Mrs. E. C. Macleod, Toronto: Mrs. Ross MacDonald, Montreal, and Annette at home. 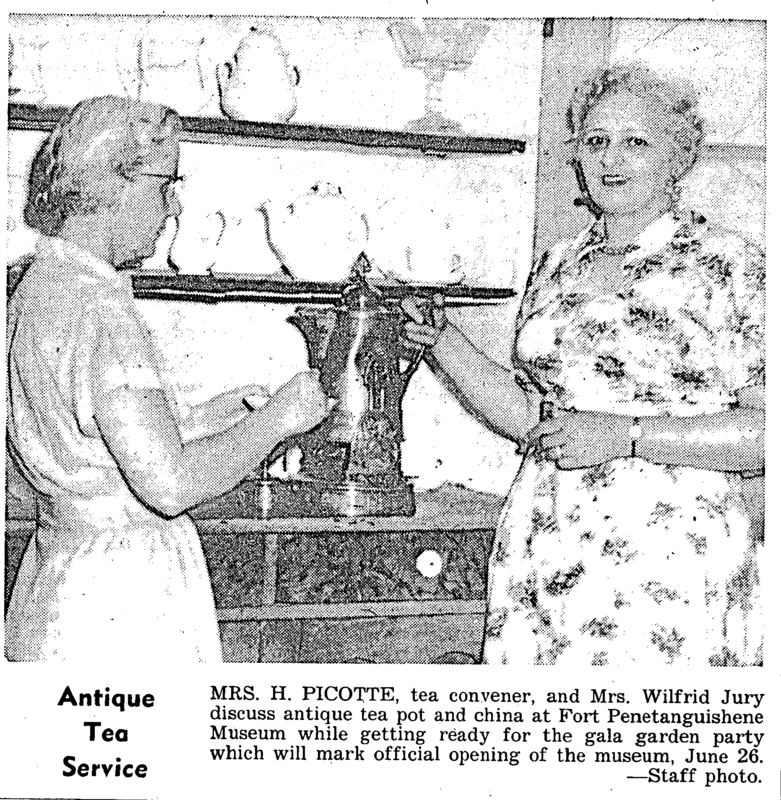 One sister, Mrs. A. Desroches, also survives. Two historical plaques, both connected with the famous old military and naval establishment which guarded British interests on the upper lakes from about 1814 to 1852, will be unveiled at Penetanguishene Wednesday, June 26 at 2 p.m. One plaque commemorates Admiral Henry Wolsey Bayfield, while the second marks the old Garrison Church of St. James-on-the-Lines. Work has begun on a new three-classroom continuation school for the parish of St. Margaret’s, on property at George Street and Dominion Avenue, Midland. It is hoped the one-storey frame structure will be ready for occupancy in September. The school will accommodate Grade 9 and 10 pupils, with the possibility of other grades later. Rev. M. A. Beriault said yesterday. Grade 9 and 10 pupils were formerly housed in two upstairs rooms in Sacred Heart School. Morley Spiker passed away on Father’s Day, last Sunday, he was in his 91st year. The museum has a few photos of Morley we would like to share in tribute to this popular Midland son. 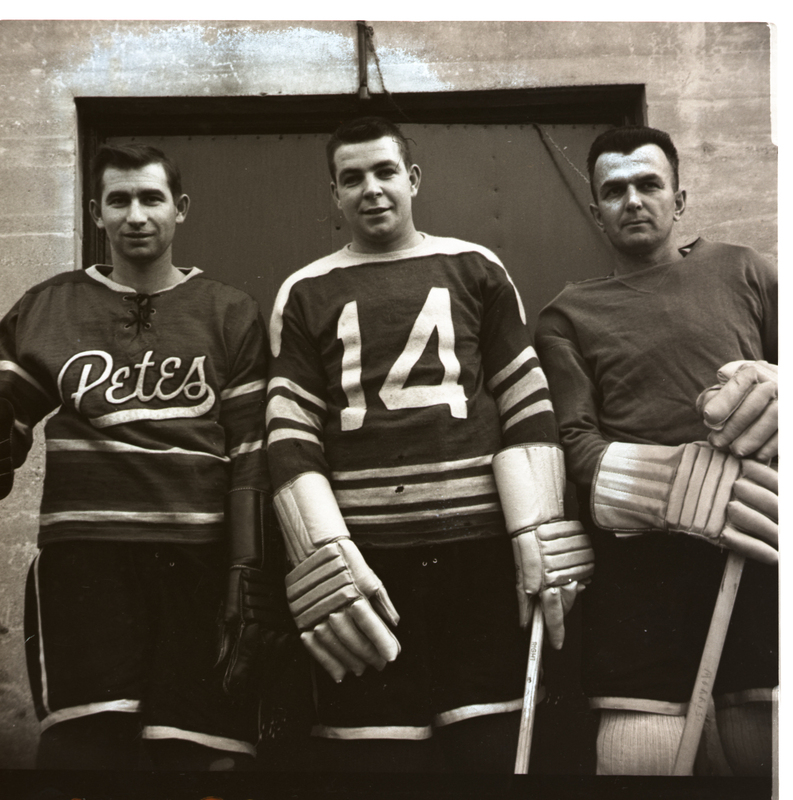 Three Midland Orphans hockey team players, Morley Spiker has Peterborough Petes jersey, Pit Legault has number 14, the third is Harry Morrison. Coach not pictured is Ed Bolan. December 11th, 1953. Three players who have played a big part in the Midland Monarchs of the Intermediate “A” Northern group’s five-game winning streak. 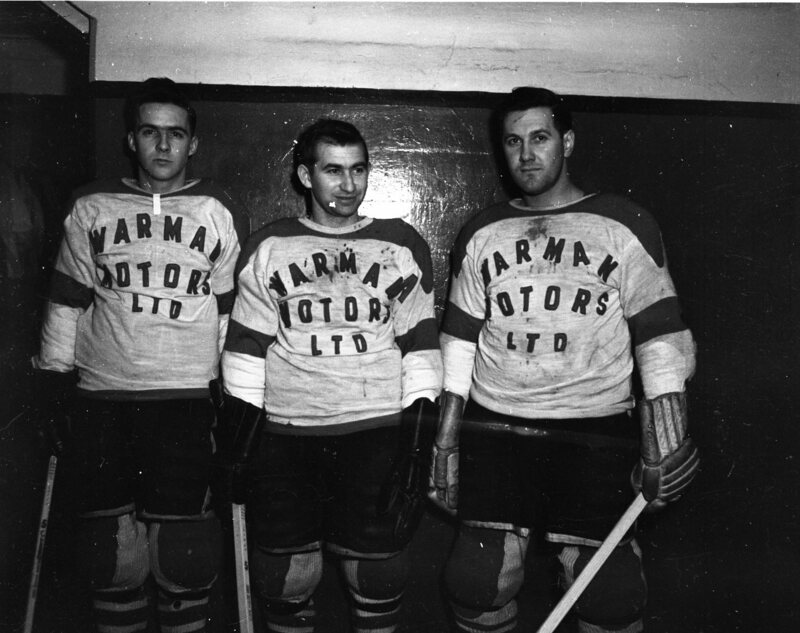 Jim Green, Morley Spiker and Marty Desroches. 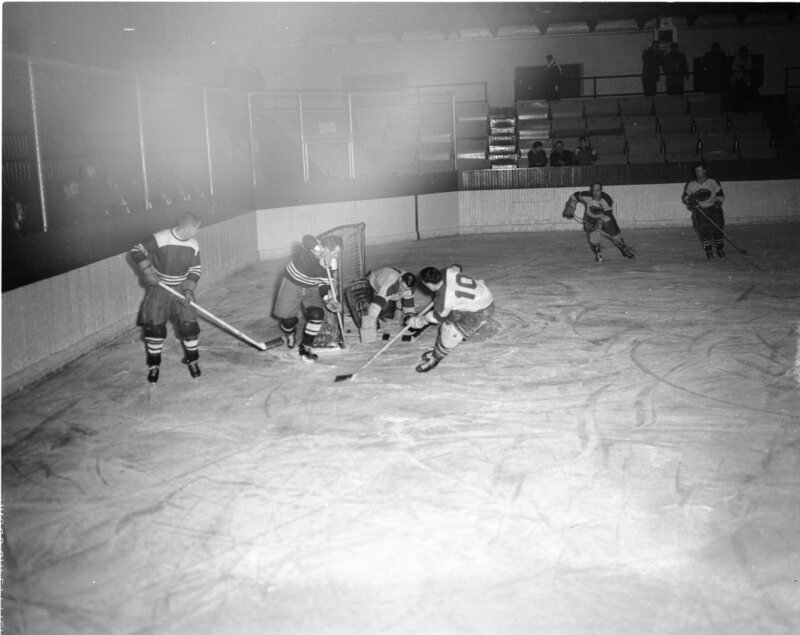 Green and Spiker are forwards, Desroches normally plays defence but is filling in on the right wing for the injured Leo St. Amand. December 24th, 1954.